Umaid Bhawan Palace is a beautiful piece of architecture giving a glimpse of the bygone era. It is located on Chittar Hill, the highest point in Jodhpur. Earlier the palace was known as Chittar Hill because of its location. The foundation of the palace was laid on 18th November 1929 by Maharaja Umed Singh. The peculiarity about this palace is that it always maintains pleasant temperature. Its construction had a very noble reason behind it—to provide work to the poor and the needy who were facing the wrath of drought. Around 5000 men worked day and night to complete the construction of the palace. Its completion took sixteen years. The unique feature of this stunning establishment is the interlocking of the carved positive and negative pieces of stones. When Umaid Bhawan Palace was built, it was labeled as the largest residence of the World with 347 rooms. It was designed by the celebrated architect H V Lanchester. He designed it in the Indo-Art-Deco style. The interiors of the palace are simply fabulous and the credit goes to the exiled interior designer Stefan Norblin. The central dome which is 110 feet high is a sight to behold. 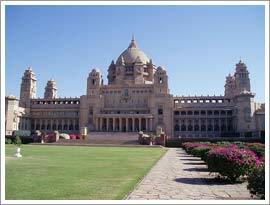 Presently Umaid Bhawan Palace is under the ownership of Gaj Singh, the successor of Maharaja Umaid Singh. He divided the palace into three different sections, one is his own residence, one a Heritage hotel, and the remaining part is a museum. The palace sprawls over an area of 26 acres and has finely manicured gardens. The museum displays a beautiful collection of pictures, weapons, clocks stuffed leopards and a big banner presented by Queen Victoria. Hotel Umaid Bhawan Palace is one of the famous heritage hotels of Rajasthan. Come enjoy a royal stay at the palace! It is an ideal accommodation for both tourists and business travelers. The hotel has 25 rooms which are divided into Standard room and Suites. The interiors of all the rooms depict the beauty and royalty of the Rajput era. Your stay here will surely be a memorable experience. Doctor on call, conference room, Internet connection with wireless connectivity, car rental, laundry/ dry-clean service, folk dance and puppet show on demand, tailor made tours and safaris in and around Jaipur, desert and village safari, air ticketing, railway reservation, bus reservation, airline ticket reconfirmation, hotel reservations around India, complementary pick up from railway station, bus stand and airport, car on rent, local site-seeing and guide arrangement. It comes under Desert triangle and is also a destination of the Palace On Wheels (a luxury train).Umaid Bhawan Palace is only 13 km from Jaipur airport.